Tumor vaccines might help the body fight cancer. A prerequisite to the development of such a vaccination is to find protein structures in cancer cells that differ from those of healthy cells. Such differences are often created by gene mutations in tumor cells, which lead to altered proteins that cells of the immune system can potentially recognize. Cancer researchers from Heidelberg have now been able to develop a mutation-specific vaccine targeting a protein that is mutated in brain cancer. In the journal "Nature", the researchers report that the vaccine arrested tumor growth in mice. 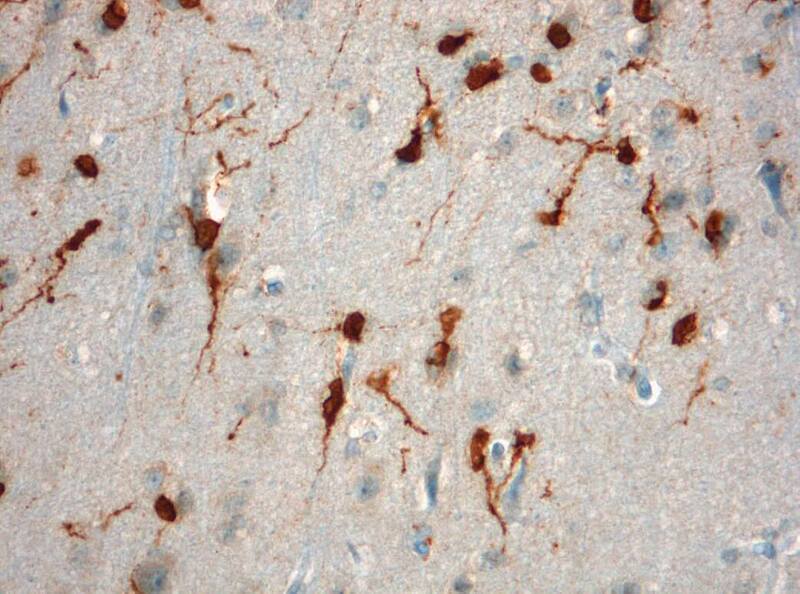 Tumor cells with particular gene mutation: protein IDH1 is altered (brown). Astrocytomas and oligodendrogliomas are subtypes of a brain cancer called 'glioma'. These incurable brain tumors arise from glial cells, a type of support cell found in the central nervous system. "Low-grade gliomas", which grow comparatively slowly, spread in a diffuse manner across the brain and are very difficult to completely eliminate through surgery. In many cases, the effectiveness of treatments with chemotherapy and radiotherapy is very limited. Gliomas can develop into extremely aggressive glioblastomas. Low-grade gliomas have a particular feature in common: more than 70% of the cases exhibit the same gene mutation in tumor cells. An identical "typo" in the DNA causes the exchange of a single, specific protein building block (amino acid) in an enzyme called isocitrate dehydrogenase 1 (IDH1). As a result, most cancer cells do not follow the original building plan for the protein; at the 132nd position in the molecule's sequence, they insert the amino acid histidine instead of arginine. 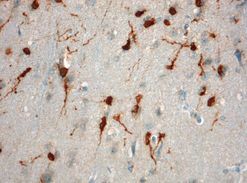 "This frequent and highly specific mutation immediately aroused our attention as immunologists: In the cancer cells, the exchange of amino acids lends the protein novel properties that can be recognized by the body's own immune cells," says Prof. Dr. Michael Platten, who heads the Clinical Cooperation Unit "Neuroimmunology and Brain Tumor Immunology" at the DKFZ; he also works as a senior consultant in the Department of Neurooncology of Heidelberg University Hospital. No other type of tumor displays the same mutation with such frequency. The mutant protein can reliably be detected using a highly specific antibody developed by Prof. Dr. Andreas von Deimling, a neuropathologist at the University Hospital and the DKFZ. This form of IDH1 is present on the surface of all tumor cells and is completely specific to the tumor. "This suggested that we might be able to use a vaccine to alert the patient's immune system to mutant IDH1, fighting the tumor without damaging healthy cells," Platten explains. In collaboration with a team of physicians and scientists from Heidelberg University Hospital, DKFZ and the Universities of Mainz, Tübingen and Hamburg, Platten and his co-workers have now made the first successful step toward a vaccine that specifically targets the mutation in the tumor. The researchers constructed an artificial version of the segment of IDH1 with the characteristic mutation using individual amino acids. This version of the peptide, which consisted of 15 building blocks, exactly matched one of the presentation molecules on the surface of the tumor cells. This is essential, because immune cells only respond to a target that is presented on so-called "MHC molecules" on the cell surface. If there is no such matching presentation, the body will not amount an immune response. To draw conclusions about the human immune system from the vaccination experiments, the researchers used mice whose cells were equipped with human MHC molecules. "After vaccinating the animals with the peptide, we were able to detect immune cells and antibodies that specifically recognized the altered IDH1 of tumor cells rather than the normal form of the enzyme in healthy cells," says Dr. Theresa Schumacher, first author of the study. In the experimental animals, this specific immune response induced by the vaccination arrested the growth of cancer cells that exhibited the characteristic IDH1 mutation. As hoped, the vaccination did not disrupt the functioning of the normal IDH1 enzyme, which plays a role in the energy metabolism of all healthy cells in the body. "In some patients with low-grade glioma we also found spontaneous immune responses against altered IDH1," Platten says. "This is a good sign; it suggests that vaccinations based on the peptide can in fact support the body's own immune system in fighting cancer cells." This gives a "vaccination therapy" good chances of success, according to the Heidelberg physicians. In a clinical trial scheduled to start early next year, with the support of the German Consortium for Translational Cancer Research (DKTK), they plan to examine the safety of the vaccine against gliomas based on mutant IDH1 in human patients, for the first time. "Most low-grade gliomas cannot be removed completely by surgery and thus often recur," says Prof. Wolfgang Wick, Medical Director of the Department of Neurooncology and head of the Clinical Cooperation Unit "Neurooncology" at the DKFZ. "Patients would therefore benefit tremendously from a vaccine that prevents this from happening."